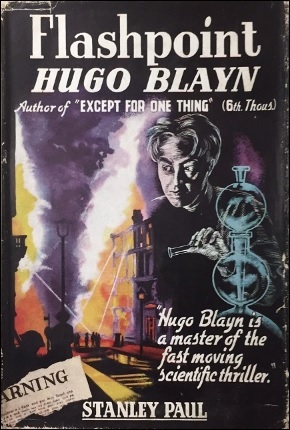 John Russell Fearn's Flashpoint (1950) was originally published as by "Hugo Blayn" and introduced "a little man who looked like the traditional bust of Beethoven," Dr. Hiram Carruthers, who's "a sort of general specialist" often called upon by the police to help them with the scientific end of a murder case – earning him the moniker of "the 'Admirable Crichton' of scientific specialists." 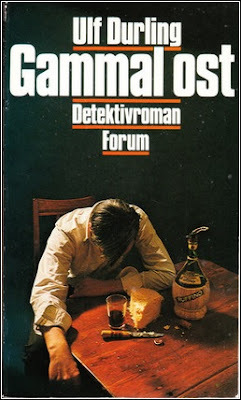 Sadly, Flashpoint was the last of the Dr. Carruther novel on my big pile, but hey, I closed this series on a high note. You could almost say it ended with a bang! The story takes place in a small, unassuming town, named Halingford, where a young man by the name of Gordon Drew returned to after an absence of eight years. Upon his arrival, Drew takes a leisurely stroll down memory lane and observed the changes the town underwent during those eight years. He was also able to reacquaint himself with a childhood friend, Janice Lloyd, who he meets again as an organizer of "a social sale-at-work" in a shabby, empty shop with tables loaded with "a miscellany of objects" – hovering over these tables were elderly, needy and "surprisingly genteel" men and women. An embarrassed Drew reflected he was "too well dressed for this sort of affair" and "perhaps too well nourished." A very brief, but interesting, glimpse at one of the bottom rungs of society of post-war Britain, which now even included the once well-bred, upper-class gentry. 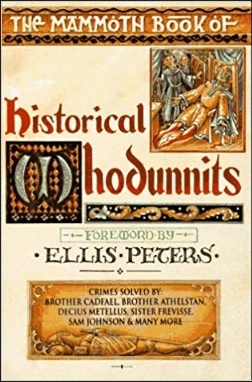 This is a side of the detective story too often ignored by so-called scholars of the genre who primarily look at the remnants of the Golden Age that are still standing, but that's a topic for another time. So let's get back to the story at hand. One of the stops Drew makes in Hallingford is "the residence where he had been born and reared," a Georgian house, but as he stands and looks at it, lost in thought, an extraordinary figure emerges from the place. A man of small stature, like a boy, with the head of Ludwig van Beethoven and tells Drew not the loiter, because his house was a private residence and not a museum. The name of the man is Dr. Hiram Carruthers. Surprisingly, this confrontation ends with Drew being invited inside and is offered a position as Carruther's secretary. So, a pretty nice beginning without a hint of the coming calamities, but, a day or two later, the local greengrocer and fishmonger, Oscar Bilkin, receives an anonymous letter with an ominous warning – telling him to "GET OUT BEFORE TOMORROW. YOU ARE ALL IN DANGER." Superintendent Clifford Denning promises Bilkin that his shop will be searched, top to bottom, and one of his men will stand guard that day. However, the next day the shop is leveled by a huge explosion and the fishmonger is killed. Here's where the problems really begin to manifest themselves. As a brief aside, I have to say that the destruction of the fish and fruit store is one of the most cold-hearted crimes I have come across in a detective story. Not only why the store had to be destroyed, but why its owner had to die and the method employed to achieve this was pure evil. This murderer is more than deserving of an eight o'clock appointment with Albert Pierrepoint. The smoking crater that once was the Bilkon shop is closely examined by police fire-experts and fire assessors of the insurance company, but they're unable to find any remnants of "an infernal machine or gadget for fire-raising." Nor did they find any trace of "a prepared chemical nature." An original impossible situation that was surprisingly easy to solve based on such clues as the funeral pace of the ice delivery van and the yellowish color of the block of ice that was delivered. These aren't spoilers. All of this was described and pointed out before the explosion. I assume Fearn was confident enough that most readers lacked the scientific knowledge to figure out "this ingenious little trick," but here he severely underestimated the repository of arcane knowledge of detective readers. Luckily, there were two more quasi-impossible fires and explosions. Rupert Granwell is the manager director and owner of a chain-store, who received a similar anonymous warning, which brought in the police who, once again, searched every floor of the department store and surrounded the place with policemen – only to see how the building inexplicably catches fire and is consumed by the flames. A salient detail is that the dissatisfied head dispenser of the in-store pharmacy, Clayton Ross, walked out on Granwell without giving his notices and simply disappeared. A third and final incident happens when an explosion kills the local florist. 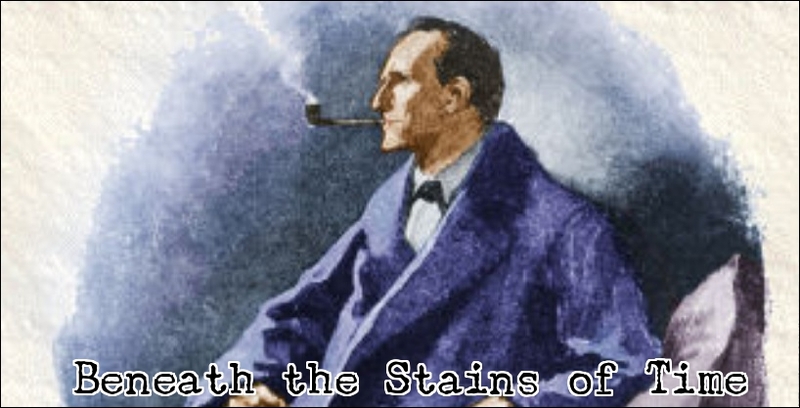 Superintendent Denning enlists Carruthers to help him figure out the secret behind these mysterious fires and explosions, or else the case might go to Scotland Yard, but Carruthers only provided a scientific explanation for the (quasi) impossibilities. It was Denning who found the motive and colored the murderer. And this is where Flashpoint distinguishes itself from Fearn's other detective novels. Usually, the impossibilities are the focal point of the plot and the murderers tend to be fairly easy to point out, but here it was exactly the other way around. The impossibilities were more than solvable, especially the first one, but the murderer this time was not as easily spotted. On the contrary, it took me a while before I caught on! If I remember correctly, this is the first time that happened with Fearn. I also have to give him props for the ambitious motive of the murderer. A nifty twist on one of the age-old motives people have killed for throughout the history. So, all in all, I would group Flashpoint together with Thy Arm Alone (1947), Except for One Thing (1947), Death in Silhouette (1950) and the posthumously published Pattern of Murder (2006) as one of Fearn's triumphs. 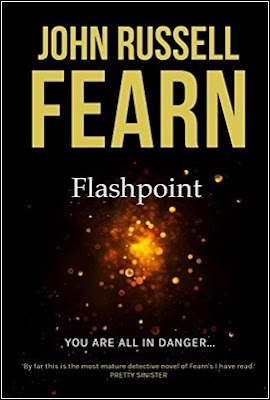 I commented in the past that Fearn was probably closer to Arthur Porges than to John Dickson Carr and Flashpoint gives the reader an idea what a novel-length detective story by Porges could have been like. So what more do you want? On a final note, John Norris of Pretty Sinister Books reviewed Flashpoint before it was reissued by Endeavour Press earlier this year. It's well worth a read as he touches on things I passed over. Earlier this year, I reviewed two, multi-part episodes of Detective Conan, an anime based on the successful, long-running manga series by Gosho Aoyama, entitled The Cursed Mask Laughs Coldly and The Case of the Séance Double Locked Room, which Ho-Ling Wong recommended on his blog – both of his reviews can be found here and here. Ho-Ling had another recommendation for me in the comments, episodes 203-204, as it features "a return of the Cursed Masks most popular original characters." I finally got around to watching it. not as grand or elaborate a detective story as the previous episodes discussed on here. All the same, the episodes had a solid, well-constructed plot with a minor locked room problem and a daring alibi-trick that would have made Freeman Wills Crofts proud. Richard Moore, Rachel and Conan are spending a couple of days at a remote hotel, near the mountains, where the twin maids, Minaho and Honami, who previously appeared in Cursed Masks now work. And they spot another familiar face at the hotel. One of the guests is a well-known actress, Bizen Chizuru, who's staying at the hotel with her husband, Shiromoto, who has development plants for the area and this may threaten a nearby mountain plateau – where there are many "rare butterflies and plants." Something that worries the hotel manager, Arimori. Chizuru and Shiromoto are joined later that evening by the president of a drama production company, Miyabe Kouta, who begs Chizuru to voluntary relinquish a movie role, because the sponsors want a younger actress to take her place. This scene ended with Chizuru's biggest outburst of the day. Conan observed early in the episode that "her image is different from TV and the movies." Chizuru has been adversarial and unpleasant the moment she crossed the threshold of the hotel, publicly humiliating her husband, talking down to the staff and shamelessly flirting with Moore, but getting replaced on a movie angered her. She makes a veiled threat of suicide and storms off to her room. However, everything appears to be normal the following morning. Some of the hotel guests and staff are going picnicking on the plateau, while Moore settles down on the coach with a VHS of a Yoko Okina TV-drama. Moore is given the master keys of the hotel and is left with the twins, the cook and Chizuru – who remains sulking in her room. So, when at the end of the day, she still has not shown herself they decide to go up and take a look, but the door-guard was engaged and the door had to be forced open. Chizuru is hanging inside from a ceiling fan. As always, Conan subtly drops hints to help Moore and the local police figure out this is a case of murder clumsily disguised as suicide. Surprisingly, it was Moore who immediately figured out the, admittedly, simplistic locked room trick when he sees the scratch marks on the door-guard. So the locked room is only a tiny aspect of the story and the meat of the plot is found on the murderer's Croftian alibi. A seasoned mystery addict can instinctively point out the murderer, because there are so many tells, but the real challenge lies in demolishing this persons apparently cast-iron alibi. Admittedly, the risky alibi-trick is not entirely believable, mostly the first part of the trick, but it had glimmer of originality and, somehow, felt pleasantly old-fashioned – like one of the alibi stories I read by Crofts (e.g. Mystery in the Channel, 1931). I still liked it. Conan dismantled the alibi with such clues as the air conditioning, lighting on the hotel roof and a white, powdery substance on the victim's dress. So the plot stuck together pretty well, but, where the story is briefly lifted to the same heights as Cursed Mask and Double Locked Room, is when Conan (through Moore) speaks those sad, final lines to the murderer – ending the episode on a somber note. So, on a whole, not as good as the two previously mentioned episodes, but still pretty good by itself with a daring alibi-trick that will delight fans of Crofts. I hope you're taking notes, JJ. Last month, I reviewed Brought to Light (1954) by E.R. 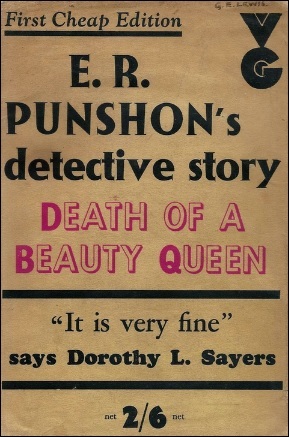 Punshon, a late entry in the series, which saw Bobby Owen at the tail-end of his career when he had reached the rank of Deputy Commander of the Metropolitan Police. The story was excellent, full of zest and vitality, but ended my post with commenting that I preferred the early period novels when Owen was a young, fresh-faced policeman moving through the ranks – traveling the British countryside on his motorcycle. So I decided to return to one of the earlier novels when Owen was still working under the guidance of Superintendent Mitchell of Scotland Yard. 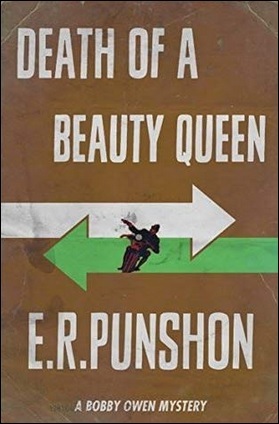 Death of a Beauty Queen (1935) is the fifth novel in the Bobby Owen series and begins with a beauty contest in the Brush Hill Central Cinema, organized by Mr. Sargent, who's the manager of the cinema. Before I go on, a brief aside on the setting of the story: last year, I wondered in my review of John Russell Fearn's One Remained Seated (1946) how many detective novels or short stories had a cinema as setting, because it looks as if they are few and far between – only P.R. Shore's The Death Film (1932) and Fearn's Pattern of Murder (2006) came to mind. Now we can add Punshon's Death of a Beauty Queen to the list. Even if the cinema was only used here as the stage for a beauty contest. The dead-on favorite to win the contest is Miss Caroline Mears, "a veritable goddess of old Grecian dream," whose only flaw are her hard, blue eyes, but her overall beauty silenced the dense crowd for a minute before bursting into applause. Before she can be announced as the winner, Mears is found fatally wounded in her private dressing room and is rushed to the hospital. Where she died upon arrival. Superintended Mitchell and Sergeant Bobby Owen quickly come to the conclusion that there were several people in the "regular pandemonium" backstage with a potential motive for murder. Mears played a dirty trick on one of the contestants, Lilian Ellis, which effectively ruined any chance she might have had. Ellis had been promised a job as permanent mannequin at the Brush Hill Bon Marche, if she met with any success, but Mears spoiled those plans. And she was known to have a temper. Mr. Sargeant has been flanked the whole evening by Paul Irwin, an influential member of the borough council and a hard-line Puritan, who's only son, Leslie, is sweet on Mears and wants to marry her – much against his wishes. They discover Leslie in Mears' dressing room and he flees. Shortly after the murder, a man arrives at the cinema, named Claude Maddox, introducing himself to Mitchell and Owen as the fiance of Mears. And then there are such complications as to what happened to the victim's handbag, who was the "tough looking bloke" looking for one Carrie Quin and why was the murder weapon traced back to the door-keeper, Wood. So the premise is fairly standard affair: a body surrounded by a small circle of suspects supplied with motives and opportunity. Unfortunately, this is the only problem and the story lacked the labyrinth of plot-threads characteristic of Punshon's work, which made this one of his unusual slender detective stories – much like It Might Lead Anywhere (1946). It didn't help that the murderer was incredibly easy to spot. Nevertheless, it was, always a well written story and the last half sprung a pleasant surprise on me when it introduced two, (quasi) impossible situations. 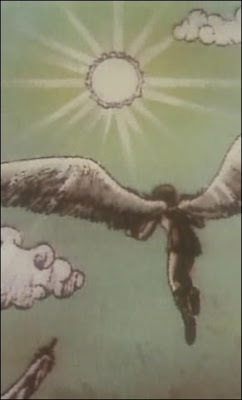 Firstly, a suspect escapes from the police, in bare feet and pajamas, but, unlikely as it may seem, this person appears to have vanished into thin air. Successfully eluding the posse of constables. This much amuses the British press and the world-wide community who reported and speculated wildly on the matter. Several prominent Nazis in Germany expressed their believe that "the Jews were at the bottom of the whole thing," while French newspapers dispatched special correspondents "to report on this strange manifestation of 'l'hysterie Anglaise.'" A fun little side distraction in the story. A second, full-blown locked room mystery is introduced in the last three chapters of the book when a murder is committed in a cottage under police observation, back and front, but the only other person on the premise was a maid – who obviously is not the murder. The locked room trick also explains the unlikely escape of the bare-footed suspect, but these closely linked impossibilities are slightly marred by the fact that the ancient solution was cribbed from Conan Doyle. And not clued at all. So, while I appreciate to find two impossible crimes in a book not listed in Locked Room Murders (1991), I could have done without them. You see, I picked Punshon to smear out my locked room reading and have a bit of variation. What does Punshon do? He springs not one, but two, on me. I should have gone with The Dusky Hour (1937) or Suspects – Nine (1939). Oh, well. All in all, Death of a Beauty Queen is a mixed bag of tricks. It was good to see Owen back at the side of Mitchell and him playing a secondary role suddenly reminded me of those written by Christopher Bush, in which Ludovic Travers plays the shadow of Superintend George Wharton. The book was as well written and characterized as any of Punshon's best detective novels, but the plot was unable to sustain itself pass its strong opening. On a whole, not too bad, but Punshon has written better. Ulf Durling is a Swedish physician, psychiatrist and a teacher of psychiatry, who became the director of the Danderyd hospital north of Stockholm, but during the early 1970s he penned a detective novel, Gammal ost (Hard Cheese, 1971), which earned him the Swedish Academy of Crime Fiction's award for best debut – initiating his secondary career as a mystery writer. After sixteen novels and nearly a hundred short stories, the SAFC honored Durling with the title of Grand Master. A 2014 short story, "Fallfrukt" ("Windfall"), was printed in the November, 2016, issue of Ellery Queen's Mystery Magazine and collected a year later in The Realm of the Impossible (2017). The short story was better than expected, for a Swede, but the solution arguably disqualified it as an impossible crime story. However, it inspired me to finally toss Hard Cheese on my towering pile. Something I had been reluctant to do before. One of my early forays into the genre was the work of two Swedish crime writers, Maj Sjöwall and Per Wahlöö, but they were so awful that I probably would have abandoned the detective story, there and then, had it not been for A.C. Baantjer and Agatha Christie – who had already shown me a very different kind of detective story. You can blame Sjöwall and Wahlöö for my unapologetic hostility to the modern, character-drenched crime novel during my years as an apprentice detective fanboy. So how did Durling fare? Do we still have to scrub Sweden from the map for their part in the Scandinavian noir or did I find a pinprick of hope in Durling? Well, let's find out. 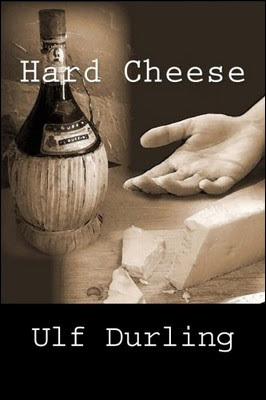 Hard Cheese was translated by Bertil Falk and published by John Pugmire's Locked Room International. I suppose the plot is best described, on the surface, as a blend of Leo Bruce's Case for Three Detectives (1936), John Dickson Carr's The Arabian Nights Murder (1936) and Peter Lovesey's Bloodhounds (1996). The story has three narrators with each narrative answering questions from the previous section, or raising new ones, which reminded me of the structure of The Arabian Nights Murder and two of the narrators belong to an intimate circle of friends – who meet weekly to discuss and dissect their favorite detective stories. Something that obviously reminded me of Bloodhounds, but the humorous first part of the story, with the three amateur detectives taking a wack at the case, recalled Case for Three Detectives. Johan Lundgrun, Carl Bergman and Dr. Efraim Nylander are the three elderly men who hold weekly meetings to discuss detective stories and the first part is narrated by Lundgrun. During the 35th meeting of the group, in 1969, Bergman eagerly told Lundgrun and Nylander that he had a visit from his son, Detective Sergeant Gunnar Bergman, who indiscreetly told him the particulars of a case he's currently investigating – a case with all the trappings of a fictional locked room mystery! One that happened in their own, small town backyard. A shabby guest, Axel Nilsson, is found dead in his room of a seedy, second-rate hotel, the Little Boarding-House, after the cleaning-lady was unable to enter the room. The door was battered down and inside they found Nilsson's lifeless body: lying fully dressed beside the bed and evidence at the scene suggests he had his the back of his head on the footboard. Someone had emptied the content of a bottle of wine over the body. Nevertheless, it still appears to be a case of an unfortunate (drinking) accident, because the door was locked from the inside with the key sticking in the door lock and the windows were closed. So, if this was murder, the primary problem is how the murderer entered and left a locked hotel room. I think this first narration is easily the best part of Hard Cheese. Lundgrun, Bergman and Nylander do a lot of woolgathering, constructing and demolishing numerous false solutions, which were all modeled around the fragmentary information given to Carl. So, naturally, they come up short, but I love a good piece of amateurish armchair detective work and this section of the story had it in spades. The second part of the story, narrated by Detective Sergeant Gunnar Bergman, is more grounded in facts and has him tangling with the shady proprietor of the Little Boarding-House, Mr. Blom – who has found a lucrative way to make certain guests pay more for their room. Another character Bergman has to deal with is a local drunk and petty criminal, Algot Cronlund, who turned out to hold the key to the problem of the locked door. I thought this was an interesting contrast to the previous part with the three armchair detectives attempting to crack the case. Sadly, this second part also had shades of the troubled, Scandinavian policeman. Bergman is not an alcoholic with a broken marriage, but his children can be a handful and he's very aware of his own (intellectual) short comings. He appears to be not entirely happy about his life, the town he lives in or his ramshackle car. This is why I, like Dr. Gideon Fell, prefer the chuckle of the Great Hanaud or the deadly bells of Fenchurch St. Paul over the hum of everyday life. The third and last part is narrated by one of three detective readers, Dr. Nylander, who rapidly solves the case based on the character and backstory of the victim, the bottle of wine and a wedge of cheese that had been found in the waste basket of the hotel room. Unfortunately, there are a number of problems with the solution. Firstly, the locked door of the hotel room began as the key problem of the plot, but the second half pretty much dismissed this aspect as irrelevant with an incredibly simple explanation. Something I could easily forgive, because Case for Three Detective pulled a similar gag. Once the titular detectives had paraded their intricate, but incorrect, solutions around, Sgt. Beef solved the case with a plain, simple explanation – reached by routine detection and commonsense. And it worked. During was unable to replicate the same effect here as the story lacked in the fair play department and the identity of the murderer has its own issues, which is linked to the lack of fair play. But the most galling was the postscript. If you forget about the locked room angle, the murder method is absolutely ingenious. A trick you hope to find when opening the pages of a detective novel, but the pointless postscript trampled all over it. Hard Cheese started out as a parody of the detective story, but Durling ensured that as little of the actual detective story reached the finish line and tripped the best part on the last page of the book! So this made Hard Cheese more of a deconstruction than a parody of the detective story and that approach just doesn't work for me. I'm too much of a purist for that. On a whole, I did not dislike Hard Cheese, on the contrary, it was an enjoyable read and really liked the first part of the story, but you should not expect it to make my best-of list for 2018. On the upside, I'm now completely up-to-date with LRI. I've read everything they've published. Even Derek Smith's Model for Murder (1952)! So I hope, by the time this post goes live, Pugmire has announced a new title. I need my regular locked room fix! Paul Doherty's The Godless Man (2002) is the second entry in the Telamon Triology, bookended by The House of Death (2001) and The Gates of Hell (2003), which tracks the ordeals of a talented physician, named Telamon, who acts as one of the "most trusted counselors and confidants" of his childhood friend, Alexander the Great – who were both tutored as boys by Aristotle in the Groves of Mieza. Alexander has a personality and god-like ambitions that tend to be a test to the methodical, level-headed physician. 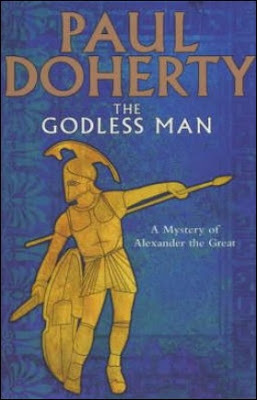 The Godless Man is set in 336 BC and Alexander has destroyed the Persian armies at the battle of Granicus, capturing city after city, but the hungry Lion of Macedon is on the prowl for a port. So he took the city of Ephesus. A Greek city rife with deep-seethed rivalries, political intrigue and bloodletting. Ephesus was a vassal of the Persian Empire and the elites of the city, the Oligarchs, supported the Persians, but they faced in strong opposition in the Democrats and their feud is closely-linked to an apparently never-ending string of murders – basically ancient gang warfare. When the city falls to Alexander, the Democrats are given an opportunity to purge the Oligarchs. Men, women and children are dragged to the market square, tried and summary executed. The bodies are stacked high when Alexander puts a stop to the bloodletting, because he wants to leave a peaceful, unified city behind as he marches deeper into enemy territory. There is, however, a problem. A group of mighty Oligarchs, lead by Demades, took refuge inside a fortified shrine, the Temple of Hercules. A holy sanctuary not even a lynch-mob dared to violate. Alexander promised the Oligarchs that they were allowed to leave unscathed and "not a hair on their heads would be harmed," but the whole group, including a Macedonian guard, is massacred during their final night inside the shrine and evidence suggests most of the victims were trampled to death – as if a wild horse had entered the shrine and "stamped on each man as he lay asleep." Another body was blackened by fire and the last one appeared to have been scratched to death. However, the most baffling aspect of this veritable holocaust is that the shrine was only guarded by Alexander's soldiers, inside and out, but hermetically sealed. The Temple of Hercules is an ancient and simple structure: a heavily beamed roof supported by columns on both sides with small windows that are high and narrow. The main entrance is sealed and guarded, while the rear door is bolted from the inside and sealed from the outside with Alexander's insignia in purple blobs of wax. So how could eight men be brutally murdered inside a sealed shrine that was ringed by soldiers? However, this is not the only impossibility to occur inside the Temple of Hercules on the night of the murders. The shrine housed a holy relic, a silver vase, which reputedly holds a earthenware jar containing some of the poison which killed Hercules. A poison known as Hydra's Blood. The silver vase is kept on a stone plinth, firmly rooted in a bed of concrete, protected by "a circular pit" of glowing charcoal and the heat from it's quite intense, but, when they entered the temple, the vase was taken from its plinth and moved to a dark recess of the temple – while the bed of charcoal was still glowing. So who and why moved the vase, but, more importantly, how did this person cross the circular pit. On the surface, this impossibility strongly resembles the problem of the stolen crown from A Murder in Thebes (1998), protected by a pit of red-hot charcoal, but The Godless Man had the better solution of the two. I think this was actually the best of the three locked room problems in this story. A third (impossible) murder occurs very late in the book, when a character apparently hanged himself in a bolted writing room with shuttered windows, but the explanation is pretty basic. I don't believe the solution to the massacre inside the sealed temple will set any locked room enthusiast on fire, but the trick was better than I anticipated. I found the presence of a uniformed soldier among the victims incredibly suspicious and, when the dark recesses were mentioned, I began to suspect an extra person had been present in the shrine the whole time – clad in the tunic of a Macedonian soldier. This person simply blended in with the guards when they entered the temple to discover the massacre. However, the actual explanation turned out to be a little more involved and slightly more original than my initial idea. I really appreciate that in a locked room mystery. As you can probably guess by now, this is only a fraction of the overall plot and bodycount. The slaughter of eight men at the temple is supposed to be the work of a Persian spy, The Centaur, who took his name from a society of Ephesian assassins, The Centaurs. The original group had been wiped out, but The Centaur took their bloody mantle and left behind a trail of blood in the city. A well-known courtesan is murdered along with her porter, maid and a house-guest. An important witness is burned to death in his prison cell and then there's the previously mentioned locked room murder, which was staged as a suicide, but the story also had a sub-plot and involves a face from Alexander's past, Leonidas – an army veteran who loves to drink and dreamed of finding lost treasure. One day, Leonidas is found face down in the dirty pond of the House of Medusa. A gloomy, ghost-infested place of ill-repute. This plot-thread is resolved halfway through the story and the answer unearths yet another mass murder in Ephesus. Telamon is tasked by Alexander with piecing all these puzzles, within puzzles, together. 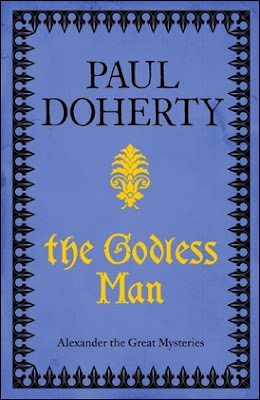 The Godless Man was far more focused on the plot than The House of Death, which was more of a historical thriller with an origin story, but, while the plot has some good (locked room) ideas, it did not entirely measure up as a proper, fair play detective story. A lack of proper clues made it look as if the murderer was picked at random and made for a slightly underwhelming revelation, but liked all of the impossible crime material. The impossible crimes are, unquestionably, the best bits of the plot. So, on a whole, this was still a good read. However, I can only really recommend it to long-time readers of Doherty and locked room enthusiasts. Theodore Mathieson was an American schoolteacher from Oregon, who taught in the public high schools of California, but turned to writing during the late 1950s and published a number of novels, which include the historical mystery The Devil and Ben Franklin (1961) and two juvenile detectives featuring The Sleuth Club – entitled The Door to Nowhere (1964) and The Sign of the Flame (1964). So those titles have been jotted down for my future explorations of the juvenile mystery genre. Mathieson also penned a score of short stories that were published in Alfred Hitchcock's Mystery Magazine and Ellery Queen's Mystery Magazine. The first of these short stories, "Captain Cook, Detective," spawned a twelve-part series of historical standalone stories starring famous figures from history as detective. Galileo, Alexander the Great, Hernando Cortez, Alexandre Dumas and Florence Nightingale were all fitted with a caped mantle and deerstalker hat by Mathieson. The most-well known and frequently anthologized story from this "Great Detectives" series is "Leonardo da Vinci, Detective," originally published in the January, 1959, issue of EQMM, in which Da Vinci is tasked with finding an explanation for an impossible murder – committed in front of witnesses by an apparently invisible killer. John Norris, of Pretty Sinister Books, recently reviewed The Devil and Ben Franklin and mentioned that this short story was described Mike Ashley, a prolific anthologist, as "one of the most ingenious" of the series with "its step-by-step unravelling of a seemingly impossible crime." So I decided to take down one of the anthologies with this story and see how good this story really is. I read "Leonardo da Vinci, Detective" in Ashley's The Mammoth Book of Historical Whodunnits (1993) and takes place on a late spring afternoon in 1516 when Da Vinci, now in his sixties, has left Florence to life in France. Da Vinci is in the favor of the King of France, Francis I, but "the regal French beauty," the Queen, has never liked him. One afternoon, Da Vinci is sketching in a rose garden when a messenger from the Queen summons him to come to Amboise at once. Da Vinci is brought to an amphitheater where "a fine demonstration of marching formations" by "troops from the Netherlands, from Spain, and from Scotland," but, as the exhibition closed, Monsieur Philip Laurier, approached the empty center of the field – to blow a trumpet signaling the end. But when he began to raise his trumpet to his lips, Laurier began to stagger and crumple. The witnesses who saw this happen caught the glimpse of a knife-hilt as he dropped to the ground, but "the knife could only have been thrown by someone standing at the level of the arena floor." Philip was the only one who stood in the empty arena! Queen is very anxious that this problem is solved as soon as possible. I think "Leonardo da Vinci, Detective" is better written than plotted. Not that the plot was bad, not at all, but the clues were clumsily handled. Mathieson deserves praise for sticking to the principle of fair play and placed as many as the short story form would allow in the hands of the reader. However, they all stuck out like rusty nails. Norris has criticized John Russell Fearn's clues tend to stick out like sore thumbs, but, compared to this story, Fearn has the subtlety of John Dickson Carr. I initially felt underwhelmed by the explanation for the invisible murderer until thinking about it a little more. The trick gels perfectly with the military background and the period in which the story is set works like a red herring, because the principle idea behind the impossible stabbing is associated with modern warfare. A similar piece of out-of-time misdirection was cleverly used by Carr in Fire, Burn! (1957). I needed some convincing, but ended up liking the impossible crime trick. So, all things considered, this was not a bad story at all, either as a historical mystery or an impossible crime story, but the clumsily handling of the clues keeps this one from a first place. Nevertheless, I find it surprising that this often anthologized story never found its way in any of the specialized locked room anthologies. The detective, plot and setting are certainly original enough to be included in a line-up. Anyway, my next post is going further back into the post when I'll be looking another of Paul Doherty's historical locked room mysteries. It's like the best of two worlds!